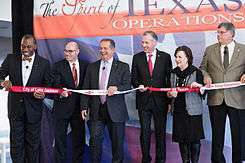 Liveris with community leaders in Lake Jackson, Texas, at the grand opening of the Texas Innovation Center in January 2016. Andrew Nicholas Liveris (born 5 May 1954) is Chairman and chief executive officer of The Dow Chemical Company. Liveris has been a member of Dow's board of directors since February 2004, CEO since November 2004 and was elected as chairman of the board effective 1 April 2006. Liveris succeeded William S. Stavropoulos as CEO in 2004, after holding the position of Chief Operating Officer. Liveris also served as Co-Chair of President Obama's Advanced Manufacturing Partnership in the United States. In January 2014, Liveris was appointed Officer of the Order of Australia for "services to international business". He also received two honorary doctorates, from The University of Queensland and Michigan State University. Liveris was born to a Greek migrant family in Darwin, Australia. His family came to Darwin on a trading ship in 1915. He attended Darwin High School until 1974 when Darwin was hit by Cyclone Tracy, and his family's construction business was destroyed. His father died when he was 15 years of age, and his uncle took over his family. Liveris then moved to Brisbane where he continued his education at Brisbane State High School. Liveris holds a bachelor's degree (first-class-honors) in Chemical Engineering from the University of Queensland (UQ). Noted UQ professor, Don Nicklin, initially encouraged him to look for work in American companies. Liveris' Dow career began in 1976 in Melbourne, Australia, as a recent university graduate. After several promotions, he helped run an Asia-Pacific business out of Hong Kong and eventually became General Manager of Dow's Thailand operations. 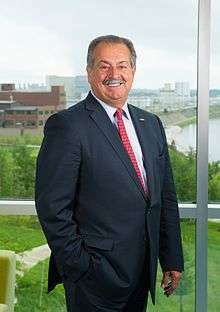 In 1992, after another promotion, Liveris relocated to the US, where he remained except for a three-year stint as President of Dow Chemical Pacific. In 2002, Dow's board considered him and a few other candidates as future postulants for CEO. In March 2016 Liveris laid out a simple three-step plan to boost the Australian economy while speaking at the WestBusiness Leadership Matters event in Perth. Liveris, appointed CEO in 2004 after the board of directors unanimously selected him, undertook a review of Dow's strategy. As a consequence, he called for Dow to reinforce its customised chemicals, plastics and advanced materials businesses (including electronics and agricultural products such as genetically improved seeds). The plan he proposed also called for reducing Dow's exposure to commodity chemicals and plastics. In October 2015 Liveris said the company was in the "late stages" of the portfolio overhaul. Part of the plan to "de-risk" the business called for the formation of joint ventures to free up Dow capital for deployment in more specialised areas of the business. The formation of joint ventures had the benefit of assuring a low cost supply of feedstocks for the customer-facing portion of Dow's business. Dow has fully exited from some basic chemicals and plastic businesses (as with the sale of Styron and its polypropylene and chlorine businesses). Liveris' largest move in this direction came with the purchase of Rohm and Haas, finalised in April 2009. This Fortune 500 company, a leader in specialty chemicals, was the subject of a global auction, which Dow won with a bid of $16.2 billion. The acquisition allowed a broader presentation to clients with regard to value-added chemicals, plastics and materials, but was beneficial to Dow also in terms of costs. The acquisition closed soon after the Financial crisis of 2007–08 took hold. The crisis caused one of Dow's joint venture partners, Petrochemical Industries Company of the State of Kuwait, a wholly owned subsidiary of Kuwait Petroleum Corporation, to withdraw from a planned partnership in basic plastics. This translated into a $9 billion loss in proceeds designated to fund the Rohm and Haas deal. The London-based International Court of Arbitration ruled in March 2012 to award Dow $2.16 Billion plus costs and interest from Kuwait due to its cancellation of the 2008 agreement. In March 2009, Liveris and his management team organised a plan to implement the Rohm and Haas integration, reducing debt from the transaction through public offerings, along with equity offers. The plan also called for the divestiture of non-strategic assets, which was accomplished through a sales process. On February 12, 2009, the company declared a decrease in dividend of about 60% compared to the previous quarter. It represented the first time the company had diminished its investor payout. Since that time, however, the company has increased its dividend multiple times. In 2011, Dow and Saudi Arabian Oil Company (Saudi Aramco) developed the joint venture, Sadara Chemical Company, worth $20 billion. This project will require a tenfold increase in Dow's Middle East regional storage and handling requirements. Sadara Chemical Company began production in 2015. Andrew Liveris speaking at a Dow event in 2015. In the fourth quarter of 2014, relying on cheap oil and natural-gas derivatives (in part due to the U.S. "fracking boom"), Dow announced the creation of new operating segments, and is significantly expanding its operations in Texas and Louisiana, investing $6 billion in its U.S. Gulf Coast plants. Dow stated it would boost its end-market orientation and increase its commitment to ethylene and propylene. Its manufacturing facilities in the United States would be enlarged by 40 percent, according to Forbes. Among the investments stipulated are the restart of a hydrocarbons cracker in St. Charles, Louisiana, a propylene dehydrogenation facility in Freeport, Texas (which started operations as of December 2015), expansion of hydrocarbon cracking capabilities in Plaquemine, Louisiana and a new cracker in Freeport Texas – as well as derivatives that serve the packaging, food safety, consumer durables, and automotive industries, with the company stating other units could become available in the future. On March 27, 2015, Dow and Olin Corporation announced a move under which Dow would separate a portion of its chlorine business and merge that new entity with Olin, with the new business having estimated revenues of $7 billion. Upon completion of the transaction, Olin became the largest chlorine producer in the world. About the exchange, Liveris stated to the Wall Street Journal: "Our drive is to get better, not bigger". Dow is, as of 2015, focusing resources on specialty chemicals that earn margins of at least 20%. On December 11, 2015, Dow and DuPont announced they planned to combine in an all-stock merger of equals. The combined company will be named DowDuPont. The company then intends to subsequently pursue a separation of DowDuPont into three independent, publicly traded companies. The three companies would include an agriculture company, a material science company, and a specialty products company. In an interview with CNBC reporter David Faber, Liveris said the merger was the culmination of more than 10 years of work to bring the two companies together. Liveris has used mergers and acquisitions to "help transform the company away from cyclical raw materials and toward higher-margin products". After the Dow-DuPont merger, the company will split into three other entities. The two companies promised upwards of $3 billion in "cost and revenue synergies". At the same time, Dow announced that it would become the 100% owner of Dow Corning Corporation, a 50:50 joint venture between Dow and Corning. Liveris is slated to retire from the company by the second quarter of 2017. Edward Breen, the CEO of DuPont will head the combined company post-merger, Liveris remaining as Executive Chairman after the deal closes. Liveris is the author of Make It in America: The Case for Re-Inventing The Economy, a book released in January 2011, based on Dow's vision for an 'Advanced Manufacturing Plan' announced in June 2010. It is divided into eight chapters and is 240 pages long. The book, published by John Wiley & Sons, was named No. 9 on the Inc./800-CEO-READ best-seller list for 2011. His first book, updated in paperback in January 2012, received wide publicity in the business world. The Financial Times called it a "widely praised polemic". According to the Wall Street Journal, in the book Liveris "calls for a national strategy to revive manufacturing", while proposing several reform ideas. The book argues that when US-based firms move their high-tech manufacturing processes overseas, the country loses skills needed for "whole groups of products", citing the Amazon Kindle as an example. Industries born in the US, such as highly advanced computer circuitry, are for this reason now existent only outside the country. Liveris, among other proposals to stimulate the industry, seeks an overhaul of the K-12 education system to include a greater focus on the sciences; and thinks the government should sign more free-trade agreements and implement a national strategy to encourage more manufacturing, a strategy including cutting taxes and making regulations more uniform in order to compete with other continents. Manufacturing, he posits, "can create jobs, economic health and growth at a level such that the services industry will never be able to do". Talking about the current state of manufacturing in an address at the University of Technology Sydney in 2016, Liveris stated "advanced manufacturing is all about short-cycle innovation, smart scale hi-tech." Commenting on Dow's incorporation of robots into its production cycle, he went on to disclose Dow now performs two million experiments a year with robots, up from 20000. Similarly, he declared Dow launched 5000 new products the previous year, while ten years back they would have launched "less than 500", alluding to technological advancements. Liveris serves on the board of directors of IBM and is a member of the executive committee of the Business Roundtable. Liveris is also a former president of the International Council of Chemical Associations. He served as Vice-Chairman of The Business Council for 2011 and 2012, and as its chairman in 2013 and 2014. He is a member of the President's Export Council, and a member of the executive committee of the Business Roundtable, and the American Australian Association. Andrew Liveris, together with Rafael Reif, President of the Massachusetts Institute of Technology, chaired the Advanced Manufacturing Steering Committee 2.0 with the goal to "revitalize" the U.S. manufacturing sector. Liveris has collaborated with Muhtar Kent, Chairman and CEO of The Coca-Cola Company, George David, Chairman of the Coca-Cola Hellenic Bottling Company, and George Stamas, Partner at Kirkland & Ellis, to found The Hellenic Initiative (THI), a non-profit, non-governmental organisation, that aims to encourage entrepreneurship and job-creating investments in Greece. As of 2015, he serves as chairman of its board. He is on the board of trustees for the United States Council for International Business and is a Trustee of the California Institute of Technology. Liveris is a member of the Business Advisory Board for the University of Technology Sydney (UTS) Business School, and in April 2012 he became a member of the Special Olympics International board of directors, a position he no longer holds. In 2015, Liveris was appointed to the Australian federal government's Growth Centres Advisory Committee to "devise policies to boost Australia's competitiveness" in the fields of education, regulation and trade. On July 2016, Liveris joined The B Team, a non-profit co-founded by Richard Branson and Jochen Zeitz. Along with Oliver Bäte and Arif Naqvi, Liveris will join the "Net Zero by 2050" initiative to fight climate change. Liveris had previously co-signed an open letter before the Paris climate conference calling for "a low-carbon, sustainable future". He will also work on the anti-corruption "Governance & Transparency" initiative. Liveris and his wife, Paula, from Broken Hill, currently reside in Midland, Michigan and have three adult children. They also own property in Sydney. In 1980, his uncle "Les" Liveris, was awarded an Order of Australia, "for public service and service to the community" making Liveris the second member of his family to receive the award. Liveris joked that being the second person in his family to receive an AO puts “a lot of pressure on my kids”. In 2005 he was awarded an honorary doctorate in science by his alma mater as well as being named Alumnus of the Year. He was appointed Inaugural Chair to The University of Queensland in America Foundation in 2011. In 2005, Liveris received an honorary doctorate from his alma mater, the University of Queensland and was named Alumnus of the Year for 2005. In 2007, Liveris received the Premier of Queensland's Expatriate Achievement Award at the Queensland Expatriate Awards at the Rainbow Room in New York. In August 2009, Liveris was personally thanked by the two American journalists who were imprisoned in North Korea. He provided former President Bill Clinton with the transportation for the Americans. In 2011, Liveris received the George E. Davis Medal from the Institution of Chemical Engineers (IChemE). The Davis medal is awarded to an eminent individual who has rendered service to chemical engineering, and is named after the founding father of the profession. It is given not more frequently than every three years. In the fall of 2011, Liveris was presented with the 2011 Distinguished Performance Award for Excellence in Public Policy from the Committee for Economic Development, the 2011 International Leadership Award from the United States Council for International Business, the Legend in Leadership Award by the Yale Chief Executive Leadership Institute, and named Platts Global Energy Awards CEO of the year. In February 2012, Liveris received the Archbishop Iakovos Leadership 100 Award for Excellence. In March 2012, Liveris served as foreign co-chair at the China Development Forum in Beijing. In March 2012, Liveris was awarded the Aristeio Award in Business by the American Hellenic Council. In June 2012, Liveris was bestowed with the Inspired leadership award presented by The Performance Theatre at their annual gathering in the London Film Museum. In August 2012, Liveris was named by the Australian Financial Review to the BOSS list of True Leaders. In October 2012, Liveris was awarded the 2013 International Palladium Medal of the Société de Chimie Industrielle. In March 2013, Liveris was awarded the 2013 Chemical Industry Medal by the Society of Chemical Industry. In May 2013, Liveris was honoured with the Eisenhower Award by Business Executives for National Security, and the Vanguard Award from the Chemical Education Foundation. In January 2014, Liveris was appointed Officer of the Order of Australia for "services to international business". In 2015, Liveris received an honorary doctorate from Michigan State University. Liveris received the 2015 ICIS Kavaler Award, having been listed as #1 "Power Player" in the global chemical market four times (2010, 2012, 2013 and 2015) by the ICIS Chemical Business magazine. Liveris was listed in the Financial Times' Top 30 Executive Allies. Liveris received the Corporate Leadership Award from the American Chemistry Society in 2016. ↑ "Andrew Liveris: Executive Profile & Biography – Businessweek". investing.businessweek.com. Retrieved 19 July 2012. ↑ "Andrew Liveris: Success Story". SuccessStory. Retrieved 26 May 2016. ↑ "President Obama Launches Advanced Manufacturing Partnership Steering Committee "2.0"". The White House. The White House. Retrieved 12 November 2015. 1 2 3 4 5 6 7 8 White, Andrew. "Andrew Liveris is the accidental CEO - of Dow Chemical". The Australian. The Australian. Retrieved 12 November 2015. 1 2 "#165 Andrew N Liveris – Forbes.com". forbes.com. Retrieved 19 July 2012. ↑ Malley, Alex. "Andrew Liveris: Feature Interview". The Bottom Line. The Bottom Line. Retrieved 13 November 2015. ↑ Dun & Bradstreet Reference Book of Corporate Managements. Dun & Bradstreet, Incorporated. 2008. ↑ Chemical Engineering. McGraw-Hill Publishing Company. 2007. ↑ Business Review Weekly: BRW. Business Review Weekly. ↑ Chemical Week. McGraw-Hill. 1998. ↑ "Dow Chemical's boss blazes an innovation trail for Australia". Dow.com. Dow. Retrieved 12 July 2016. ↑ Westervelt, Robert (October 12, 2015). "Andrew Liveris: Transforming an industry leader". IHS Chemical Week. Retrieved 22 February 2016. ↑ Bertie Charles Forbes (July 2008). Forbes. Forbes Incorporated. ↑ Fisher, Daniel. "Shale Gas And Buffett's Billions Fuel Turnaround At Dow Chemical". Forbes. Forbes. Retrieved 12 November 2015. ↑ Moore, Heidi N. "Parsing Dow Chemical CEO Andrew Liveris". Wall Street Journal. Wall Street Journal. Retrieved 12 November 2015. ↑ Kaskey, Jack. "Dow Awarded $2.16 Billion From Kuwait Over Aborted Deal". Businessweek. Businessweek. Retrieved 12 November 2015. ↑ Crooks, Ed. "Dow Chemical to spin off low-margin assets". Financial Times. Financial Times. Retrieved 12 November 2015. ↑ "Against the Grain: Buy Dow Chemical!". The Street. The Street. Retrieved 7 October 2015. ↑ "Ex-Dividend Reminder: Dow Chemical, Agrium and Yamana Gold". Forbes. Forbes. Retrieved 22 January 2016. ↑ "Sadara Chemicals Complex, Al Sharqiya, Saudi Arabia". ChemicalsTechnology. ChemicalsTechnology. Retrieved 7 October 2015. ↑ "Sadara Chemical Company has successfully started up its first production plant, moving on schedule from the construction to the operational phase.". GPCA. GPCA. Retrieved 6 January 2016. 1 2 McMahon, Jeff. "Dow Bets $6 Billion That U.S. Fracking Boom Will Last Another Decade". Forbes. Forbes. Retrieved 24 November 2015. 1 2 Szal, Andy. "Dow's Next Big Move — A $6 Billion Manufacturing Expansion". Manufacturing.net. Manufacturing.net. Retrieved 24 November 2015. ↑ Furr, Laura. "Dow opens massive production facility in Freeport". Houston Business Journal. Houston Business Journal. Retrieved 6 January 2016. 1 2 Fisher, Daniel. "Will $5B Sale Of Dow Chemical's Chlorine Business Silence Its Critics?". Forbes. Forbes. Retrieved 6 October 2015. ↑ SIDER, ALISON; DULANEY, CHELSEY. "Dow Chemical to Split Off Chlorine Business in $5 Billion Deal". Wall Street Journal. Wall Street Journal. Retrieved 12 November 2015. 1 2 Primack, Dan. "Dow Chemical and DuPont Announce Mega-Merger". Forbes. Forbes. Retrieved 6 January 2016. ↑ Ariel, Steve. "DowDuPont Will Spin Off into 3 Independent Public Companies". Yahoo Finance. Yahoo Finance. Retrieved 19 January 2016. ↑ "First on CNBC: CNBC Transcript: DuPont CEO Edward Breen and Dow CEO Andrew Liveris Speak with CNBC's David Faber on "Squawk on the Street" Today". CNBC. Retrieved 19 January 2016. ↑ Whiteman, Lou. "Dow Chemical Sees Promise in Key Markets Ahead of $130B DuPont Merger". The Street. The Street. Retrieved 2 May 2016. ↑ Sider, Alison; Beilfuss, Lisa. "Dow Chemical CEO Plans to Leave Company After Planned Merger". Wall Street Journal. Wall Street Journal. Retrieved 3 February 2016. ↑ Clarke, Danial. "E I Du Pont De Nemours And Co (NYSE:DD) Has 21 Percent Upside Probability". The Point Review. The Point Review. Retrieved 10 June 2016. 1 2 "President Obama Launches Advanced Manufacturing Partnership Steering Committee "2.0"". Office of the Press Secretary. The White House. Retrieved 24 November 2015. 1 2 "FACT SHEET: President Obama Announces New Actions to Further Strengthen U.S. Manufacturing". Office of the Press Secretary. The White House. Retrieved 24 November 2015. ↑ Dodson, Andrew. "Dow Chemical Co. CEO Andrew Liveris' new book makes case for manufacturing in America". mLive Michigan. mLive Michigan. Retrieved 14 January 2016. ↑ Andrew Liveris (15 December 2011). Make It In America, Updated Edition: The Case for Re-Inventing the Economy. John Wiley & Sons. ISBN 978-1-118-29494-9. ↑ "The Bestsellers of 2011". 800ceoread. 800ceoread. Retrieved 12 November 2015. 1 2 3 HAGERTY, James R. "Assembled Elsewhere". Wall Street Journal. Wall Street Journal. Retrieved 12 November 2015. ↑ Schneiderman, R.M. "A CEO's Defense of Government". The Daily Beast. The Daily Beast. Retrieved 12 November 2015. ↑ Crooks, Ed. "WEEK IN REVIEW December 11, 2015 6:11 pm DuPont merger will keep Dow Chemical survivor at the top". Financial Times. Financial Times. Retrieved 14 January 2016. ↑ De Bernardini, Luigi. "The Role of Manufacturing in Economic Development". AutomationWorld. AutomationWorld. Retrieved 14 January 2016. 1 2 Korporaal, Glenda. "Dow's innovation on a fast track". The Australian. The Australian. Retrieved 30 March 2016. ↑ Pieper, James; Heumann, Jenny. "BASF's Kurt Bock to Lead Global Chemical Industry Association; Dow's Andrew Liveris Completes Successful Two-Year Presidency". American Chemistry Council. American Chemistry Council. Retrieved 12 November 2015. ↑ Lynch-Morin, Kathryn. "Dow Chemical CEO Andrew Liveris named chair of The Business Council". mLive. mLive. Retrieved 12 November 2015. ↑ Harrison, J.D. "Amazon's Jeff Bezos appointed chairman of Washington-based Business Council". Washington Post. Washington Post. Retrieved 12 November 2015. ↑ "PRESIDENT'S EXPORT COUNCIL MEMBERS". International Trade Administration. International Trade Administration. Retrieved 12 November 2015. 1 2 McCrum, Dan. "Catalysing the Liveris function at Dow Chemical". Financial Times. Financial Times. Retrieved 12 November 2015. ↑ Ballon, Marc. "Viterbi Awards honor engineering excellence". USC News. USC News. Retrieved 12 November 2015. ↑ "Hellenic Initiative Board of Directors". The Hellenic Initiative. Retrieved 23 March 2016. ↑ "Andrew Liveris Chairman". The Hellenic Initiative. Retrieved 23 March 2016. ↑ Griffiths, Jim. "Australia needs a management skills upgrade". UTS Newsroom. UTS Newsroom. Retrieved 12 November 2015. ↑ Hughes, Kristin. "Special Olympics Announces Additions to International Board of Directors". Special Olympics. Special Olympics. Retrieved 12 November 2015. ↑ "Our Board of Directors". Special Olympics. Special Olympics. Retrieved 24 November 2015. ↑ "Growth Centres Advisory Committee". Business. Australian Government. Retrieved 30 March 2016. ↑ "Andrew Liveris". The B Team. The B Team. Retrieved 15 July 2016. ↑ Stearns, David. "Three New Global Business Leaders Join the B Team". The B Team. The B Team. Retrieved 15 July 2016. ↑ "Open letter from CEOs to world leaders urging climate action". World Economic Forum. World Economic Forum. Retrieved 15 July 2016. ↑ Liveris, Andrew N. "Liveris: Dow, Midland stand together". Midland Daily News. Midland Daily News. Retrieved 12 November 2015. ↑ "Dow Chemical CEO Andrew Liveris Hopeful for Greece". Greek Reporter. Greek Reporter. Retrieved 12 November 2015. 1 2 "Andrew Liveris - EAIT". The Faculty of Engineering, Architecture and Information Technology. University of Queensland. Retrieved 12 November 2015. ↑ "Queenslanders Honoured in New York". Australian Consulate-General - New York. Australian Consulate-General - New York. Retrieved 12 November 2015. ↑ BORDELON, BRENDAN. "The Largest Loan in Ex-Im History Is Covered in the Clintons' Fingerprints". National Review. National Review. Retrieved 12 November 2015. ↑ Jones, Gemma. "Liveris to give Davis Lecture". ichme. ichme. Retrieved 12 November 2015. ↑ "Distinguished Performance Award for Excellence in Public Policy" (PDF). CED.org. CED. Retrieved 12 November 2015. ↑ "Dow's Liveris to Receive Global Business Group's Top Award". UCIB.org. UCIB. Retrieved 12 November 2015. ↑ Anastasio, Renée. "Yale Chief Executive Leadership Institute to Honor The Dow Chemical Company Chairman and CEO Andrew Liveris with Yale Legend in Leadership Award". Yale SOM. Yale SOM. Retrieved 12 November 2015. ↑ "BRAZIL'S PETROBRAS WINS PLATTS ENERGY COMPANY OF THE YEAR AWARD". Platts. Platts. Retrieved 12 November 2015. ↑ "Archbishop Iakovos Leadership 100 Award for Excellence". Leadership 100. Leadership 100. Retrieved 24 November 2015. ↑ Lascari, Tony. "Industrial Spotlight: Liveris speaks at 2012 China Development Forum". Midland Daily News. Midland Daily News. Retrieved 12 November 2015. ↑ "American Hellenic Council to Honor Dow CEO Andrew N. Liveris". Greek Reporter. Greek Reporter. Retrieved 12 November 2015. ↑ Kauffman, Caitlin. "This Year's Inspired Leadership Award Highlighting the New 'Breed of Leadership Business Needs'". Sustainable Brands. Sustainable Brands. Retrieved 12 November 2015. ↑ "International Palladium Medal". Société de Chimie Industrielle. Société de Chimie Industrielle. Retrieved 12 November 2015. ↑ Lynch-Morin, Kathryn. "Dow's Andrew Liveris awarded Chemical Industry Medal". mLive. mLive. Retrieved 12 November 2015. ↑ "BENS to Honor Gen. Raymond T. Odierno, USA and Andrew N. Liveris, Chairman, President & CEO, Dow Chemical with Eisenhower Award". BENS.org. BENS. Retrieved 12 November 2015. ↑ Cornelis, Tommy. "Today's CEO Leader in STEM: Andrew N Liveris of Dow Chemical". STEMblog. STEMblog. Retrieved 24 November 2015. ↑ Glasgow, Will. "Let's knight Dow Chemical boss Andrew Liveris for his services to Grange". Australian Financial Review. Australian Financial Review. Retrieved 12 November 2015. ↑ Parker, Kristen. "Honorary Degrees and Commencement Speakers Announced". Research at Michigan State UniversityResearch at Michigan State University. MSU Today. Retrieved 12 November 2015. ↑ "Dow Chemical's Liveris honored with ICIS Kavaler Award for industry achievement". Midland Daily News. Midland Daily News. Retrieved 24 November 2015. ↑ Setter, Holly. "Andrew N. Liveris named top 'Power Player' by ICIS Chemical Business magazine". mLive. mLive. Retrieved 24 November 2015. ↑ Chang, Joseph. "ICIS Top 40 Power Players ranking for 2013 revealed". ICIS. ICIS. Retrieved 24 November 2015. ↑ Chang, Joseph. "ICIS Top 40 Power Players for 2015 unveiled". ICIS. ICIS. Retrieved 6 January 2016. ↑ "Top straight allies reach billions as they champion LGBT rights". Financial Times. Financial Times. Retrieved 12 November 2015. ↑ Minter, Steve. "Dow's Andrew Liveris and the Challenge of 'Dual Horizons'". Industryweek.com. IndustryWeek. Retrieved 26 July 2016. ↑ Haynes, Jessica. "Dow Chemical's Liveris receives American Chemistry Society honor". Midland Daily News. Midland Daily News. Retrieved 2 May 2016. Wikimedia Commons has media related to Andrew N. Liveris. "Dow Chemical CEO on Greek crisis, fast-track trade deal"